Does the World Need Another Giant God-Sized Computer? Posted December 21st, 2011 by David Porter & filed under Technology. 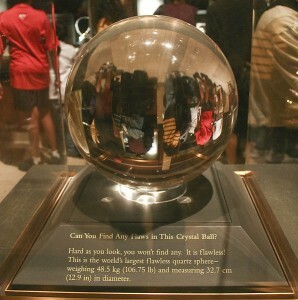 Does the World Need A Crystal Ball? In a time of higher taxes, expenditure reductions, belt-tightening all round, is it much comfort to know that the EU is planning to spend about 1 billion euros (£900 million) on a device that would, in effect, tell the future? They plan to set up the Living Earth Simulator project which would soak up the massive rivers of data (and euros) from all the social media, government statistics and databases and any other sources they can find, to identify economic and social trends on both global and macro-location bases. The justification is that current economic models are out of date (few foresaw the scale and speed of the Eurozone meltdown except a handful of Euro-sceptic politicos), the huge supply of freely available data is not being tapped into and things like public services, taxes and demands can be better planned for and provided in financially prudent ways. That’s much the same justification as has always been used for the national census every decade, even though that may soon give way to more digitally based surveys, which will in turn feed into the EU-wide one. To make sense of it in a theoretical way is just to take a short hop from the massive Large Hadron Collider (LHC) near Geneva, Switzerland. This unique project to build the world’s largest and highest energy particle accelerator in a 27 kilometre circumference tunnel is intended to answer the most fundamental laws of physics and extend human knowledge and understanding of the ultimate laws of nature. There is some speculation that they may have found at least part of the explanation of the origins of life, under experiments to find the elusive ‘Higgs Bosun’. Technically the Living Earth Simulator is a synchroton designed to collide opposing particle beams of either protons or lead nuclei. Hadron means particles composed of quarks. It may require the need for yet more new words in the lexicon of technology and science. It is the work of Cern, the European Organisation for Nuclear Research, employing the skills of ten thousand engineers and scientists from over 100 countries besides hundreds of universities and laboratories. In short, the greatest minds of the age. Like much that happens in the real world of science and technology, it was predicted years ago by sci-fi writers. Fans of the movie 2001: A Space Odyssey will recall the on-board computer HAL, who could read lips and anticipate human actions. In this case, Douglas Adams’ novel The Hitchhiker’s Guide to the Galaxy (1978) envisioned just such a mega-computer, Deep Thought. This beast of a machine took 7.5 million years to consider the meaning of life, the universe and everything and arrive at the answer ’42’. One hopes that at a billion pounds now and ten times that when it comes, the Living Earth Simulator crystal ball will produce more that a completely incomprehensible answer to the world’s problems. And does the future become more important and worth spending more on than the here and now? Spending the future’s inheritance?